Netflix's next great original movie is upon us. Today, we have the first trailer for Hold the Dark. And it's a decidedly different kind of thriller that should stop you from complaining that there are no more original stories left in the world. Cause we don't think you've ever seen anything quite like this. Retired naturalist and wolf expert Russell Core (Jeffrey Wright) journeys to the edge of civilization in northern Alaska at the pleading of Medora Slone (Riley Keough), a young mother whose son was killed by a pack of wolves. As Core attempts to help Medora track down the wolves who took her son, a strange and dangerous relationship develops between the two lonely souls. But when Medora's husband Vernon (Alexander Skarsgard) returns home from the Iraq War, the news of his child's death ignites a violent chain of events. As local cop, Donald Marium (James Badge Dale), races to stop Vernon's vengeful rampage, Core is forced on a perilous odyssey into the heart of darkness. A gripping psychological thriller unfolds in the treacherous Alaskan wilderness when a retired wolf expert is summoned to investigate a child's disappearance. Hold The Dark, starring Jeffrey Wright, Alexander Skarsgård and Riley Keough, and directed by Jeremy Saulnier, premieres on September 28, only on Netflix. Director Jeremy Saulnier first made waves with his acclaimed crime drama Blue Ruin, which really put him on the map as a filmmaker. The story followed a mysterious outsider, who's quiet life is turned upside down when he returns to his childhood home to carry out an act of vengeance. Proving himself an amateur assassin, he winds up in a brutal fight to protect his estranged family. Next came the acclaimed thriller Green Room, which garnered quite a bit of attention. In the movie, a punk rock band is forced to fight for survival after witnessing a murder at a neo-Nazi skinhead bar. It was one of Anton Yelchin's finally performances as a leading man before his untimely death. Since shooting Hold the Dark, Saulnier went onto direct HBO's True Detective. He helmed Season 3's first two episodes, setting the tone for what will play out in these new episodes. True Detective will return to HBO in early 2019, where Saulnier's work will be on full display. Hold the Dark star Jeffrey Wright is also no stranger to HBO, as he stars as Bernard Lowe on the hit drama Westworld. He's an accomplished actor who has been around since the very early 90s. He isn't often offered the lead, but here he commands the screen in a performance that won't soon be forgotten. 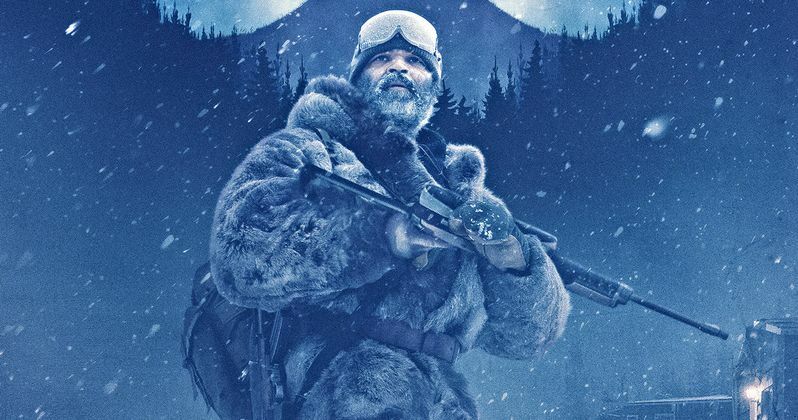 You can check out a first look at Hold the Dark direct from Netflix streaming Youtube. They also offer up the first poster. Get ready for one of the most unique movies of 2018, coming this fall. It's going to hit the chest hard.